Pro Stock driver Vincent Nobile notched another victory Sunday. Mike Neff raced to his third win of the season Sunday, winning the Funny Car portion of the Summit Racing Equipment NHRA Nationals in Norwalk, Ohio. Del Worsham, Vincent Nobile, and Eddie Krawiec also won in their respective categories at the 10th of 22 events in the NHRA Full Throttle Drag Racing Series. Neff drove his Castrol GTX Ford Mustang to a 4.211-second run at 289.94 mph past Ron Capps in the final round to collect his third win of the season and fourth career win. It was also Neff’s fifth final-round appearance in the past six races. Neff kept the points lead with his win, while runner-up finisher Capps moved up from ninth to sixth in the point standings. In Top Fuel, after collecting the No. 1 qualifier on Saturday, Worsham powered his Al-Anabi dragster to his fourth win of the season. Worsham posted an impressive time of 3.905 at 298.14 past runner-up Spencer Massey to collect his 29th career win. The win kept Worsham in the No. 1 spot in the point standings while runner-up Massey strengthened his second spot in the standings with his third final round appearance in four races. Rookie sensation Nobile held off a hot-charging Larry Morgan to collect the win in Pro Stock. Nobile drove his Mountain View Tires Dodge Avenger to a 6.615 at 208.26 mph to collect his second win of the season and move up to third-place in the point standings. In Pro Stock Motorcycle, Krawiec held off Matt Smith in the final round to get the win. Krawiec drove his Screamin’ Eagle Vance & Hines Harley-Davidson to a 7.077 run at 187.81 to get his second win of the season and ninth of his career. NHRA Full Throttle Drag Racing will return July 7-10 for the O’Reilly Auto Parts Route 66 NHRA Nationals at Route 66 Raceway in Joliet, Ill. Final finish order (1-16) for professional categories at the Fifth annual Summit Racing Equipment NHRA Nationals at Summit Racing Equipment Motorsports Park. The race is the tenth of 22 events in the NHRA Full Throttle Drag Racing Series. 1. Del Worsham; 2. Spencer Massey; 3. Larry Dixon; 4. Morgan Lucas; 5. Brandon Bernstein; 6. Antron Brown; 7. Tony Schumacher; 8. Shawn Langdon; 9. David Grubnic; 10. Ike Maier; 11. Luigi Novelli; 12. Doug Kalitta; 13. Scott Palmer; 14. Pat Dakin; 15. Bob Vandergriff; 16. Terry McMillen. 1. Mike Neff; 2. Ron Capps; 3. Cruz Pedregon; 4. John Force; 5. Daniel Wilkerson; 6. Jack Beckman; 7. Robert Hight; 8. Matt Hagan; 9. Tim Wilkerson; 10. Melanie Troxel; 11. Paul Lee; 12. Tony Pedregon; 13. Jeff Arend; 14. Jim Head; 15. 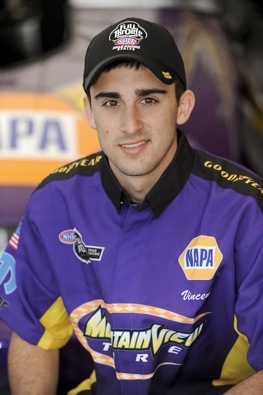 Bob Tasca III; 16. Bob Bode. 1. Vincent Nobile; 2. Larry Morgan; 3. Jason Line; 4. Greg Stanfield; 5. Allen Johnson; 6. Rodger Brogdon; 7. Ronnie Humphrey; 8. Mike Edwards; 9. Ron Krisher; 10. Greg Anderson; 11. Shane Gray; 12. V. Gaines; 13. Richard Freeman; 14. Erica Enders; 15. Warren Johnson; 16. Kurt Johnson. 1. Eddie Krawiec; 2. Matt Smith; 3. Hector Arana; 4. David Hope; 5. GT Tonglet; 6. Michael Phillips; 7. Steve Johnson; 8. Jim Underdahl; 9. Jerry Savoie; 10. Angie Smith; 11. Mike Berry; 12. Shawn Gann; 13. Andrew Hines; 14. Hector Arana Jr; 15. Chip Ellis; 16. Karen Stoffer. Top Fuel — Del Worsham, 3.905 seconds, 298.14 mph def. Spencer Massey, 3.931 seconds, 297.42 mph. Funny Car — Mike Neff, Ford Mustang, 4.211, 289.94 def. Ron Capps, Dodge Charger, 4.259, 279.09. Pro Stock — Vincent Nobile, Dodge Avenger, 6.615, 208.26 def. Larry Morgan, Ford Mustang, 6.657, 209.30. Pro Stock Motorcycle — Eddie Krawiec, Harley-Davidson, 7.077, 187.81 def. Matt Smith, Buell, 11.385, 67.65. Top Alcohol Dragster — Marty Thacker, 5.403, 263.26 def. Brandon Booher, 6.465, 107.66. Top Alcohol Funny Car — Fred Hagen, Ford Mustang, 5.571, 259.01 def. Todd Veney, Chevy Impala SS, 5.693, 253.71. Pro Modified — Mike Castellana, Chevy Camaro, 5.896, 243.24 def. Danny Rowe, Camaro, 5.960, 244.78. Competition Eliminator — David Rampy, Bantam Roadster, 7.351, 148.64 def. Sal Biondo, Chevy Cavalier, foul. SEMIFINALS — Worsham, 3.899, 298.34 def. Lucas, foul; Massey, 3.899, 299.33 def. Dixon, 3.929, 296.11; FINAL — Worsham, 3.905, 298.14 def. Massey, 3.931, 297.42. FINAL — Neff, 4.211, 289.94 def. R. Capps, 4.259, 279.09. ROUND ONE — Allen Johnson, Dodge Avenger, 6.629, 208.59 def. Greg Anderson, Pontiac GXP, 6.604, 208.52; Larry Morgan, Ford Mustang, 7.507, 139.95 def. V. Gaines, Avenger, foul; Ronnie Humphrey, GXP, 6.626, 207.66 def. Richard Freeman, GXP, 6.639, 207.88; Mike Edwards, GXP, 6.620, 208.07 def. Ron Krisher, GXP, 6.583, 209.01; Jason Line, GXP, 6.599, 207.82 def. Shane Gray, GXP, 6.616, 208.46; Greg Stanfield, GXP, 6.603, 208.59 def. Erica Enders, Chevy Cobalt, 6.778, 208.33; Rodger Brogdon, GXP, 6.627, 208.01 def. Kurt Johnson, GXP, 12.064, 96.39; Vincent Nobile, Avenger, 6.600, 208.33 def. Warren Johnson, Cobalt, 11.978, 78.13; QUARTERFINALS — Morgan, 6.662, 208.30 def. Brogdon, 6.644, 208.52; Stanfield, 6.622, 208.42 def. A. Johnson, 6.635, 208.88; Nobile, 6.616, 208.14 def. Humphrey, 6.671, 207.94; Line, 6.609, 208.55 def. Edwards, 13.387, 53.10; SEMIFINALS — Nobile, 6.616, 208.26 def. Stanfield, foul; Morgan, 6.641, 207.94 def. Line, 6.644, 208.42; FINAL — Nobile, 6.615, 208.26 def. Morgan, 6.657, 209.30. ROUND ONE — David Hope, Buell, 7.056, 187.44 def. Andrew Hines, Harley-Davidson, 7.164, 187.00; Hector Arana, Buell, 6.952, 192.60 def. Angie Smith, Buell, 6.992, 186.61; Michael Phillips, Suzuki, 7.157, 186.54 def. Chip Ellis, Buell, 17.913, 85.98; Eddie Krawiec, Harley-Davidson, 6.919, 193.90 def. Mike Berry, Buell, 7.055, 187.63; Jim Underdahl, Suzuki, 7.136, 175.23 def. Karen Stoffer, Suzuki, broke; Matt Smith, Buell, 6.959, 189.73 def. Shawn Gann, Buell, 7.099, 186.64; Steve Johnson, Suzuki, 7.223, 176.81 def. Jerry Savoie, Suzuki, foul; GT Tonglet, Suzuki, 7.023, 188.02 def. Hector Arana Jr, Buell, 15.041, 49.14; QUARTERFINALS — Hope, 6.993, 190.30 def. G. Tonglet, 7.014, 190.30; M. Smith, 6.943, 190.89 def. Phillips, 7.144, 190.94; Arana, 6.969, 193.18 def. Johnson, 7.247, 189.36; Krawiec, 6.953, 193.74 def. Underdahl, broke; SEMIFINALS — Krawiec, 7.007, 192.11 def. Hope, 7.036, 187.81; M. Smith, 6.952, 190.62 def. Arana, 7.007, 190.89; FINAL — Krawiec, 7.077, 187.81 def. M. Smith, 11.385, 67.65. 1. Del Worsham, 884; 2. Spencer Massey, 823; 3. Larry Dixon, 809; 4. Antron Brown, 731; 5. Tony Schumacher, 729; 6. Doug Kalitta, 536; 7. Brandon Bernstein, 517; 8. Morgan Lucas, 500; 9. Shawn Langdon, 451; 10. Terry McMillen, 386. 1. Mike Neff, 881; 2. Jack Beckman, 757; 3. Robert Hight, 755; 4. Cruz Pedregon, 708; 5. Matt Hagan, 599; 6. Ron Capps, 539; 7. John Force, 528; 8. Jeff Arend, 519; 9. Bob Tasca III, 495; 10. Johnny Gray, 441. 1. Jason Line, 774; 2. Mike Edwards, 725; 3. Vincent Nobile, 713; 4. Greg Stanfield, 688; 5. Greg Anderson, 677; 6. Rodger Brogdon, 631; 7. Allen Johnson, 610; 8. Erica Enders, 563; 9. Shane Gray, 468; 10. Ron Krisher, 446. 1. Eddie Krawiec, 425; 2. Karen Stoffer, 418; 3. Andrew Hines, 369; 4. Matt Smith, 350; 5. Hector Arana, 312; 6. LE Tonglet, 283; 7. Jerry Savoie, 277; 8. Michael Phillips, 245; 9. Jim Underdahl, 237; 10. Hector Arana Jr, 191.